Today's medical practices have more options than ever to help patients pay for services — but they're only useful if patients take advantage of them. In fact, patient hesitation regarding procedure costs may be depriving your practice of thousands of dollars in lost revenue each month, which is why offering patient-friendly financing is crucial to the growth of your business. In this whitepaper from LendingUSA, you'll explore the ins and outs of patient financing options and learn specific tips for presenting financing and growing revenue. The Evolution of Patient Financing - The way your patients expect to pay for treatment has changed dramatically in the last few years. Discover what this means for your business. 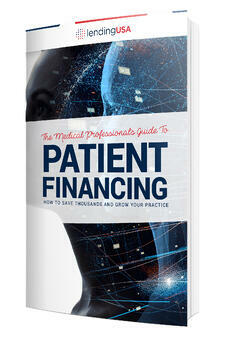 How to Offer Financing - One of the biggest obstacles to treatment acceptance is usually cost. This eBook has tons of helpful tips on how to best offer financing so you can increase acceptance rate. Why Financing is Better for Patients - LendingUSA allows patients to pay the out-of-pocket costs for procedures in low monthly payments, while ensuring merchants get paid quickly and reliably.